Sanicle Meadow Rue is a wiry, erect herb with stems about 30 cm tall, hairless. 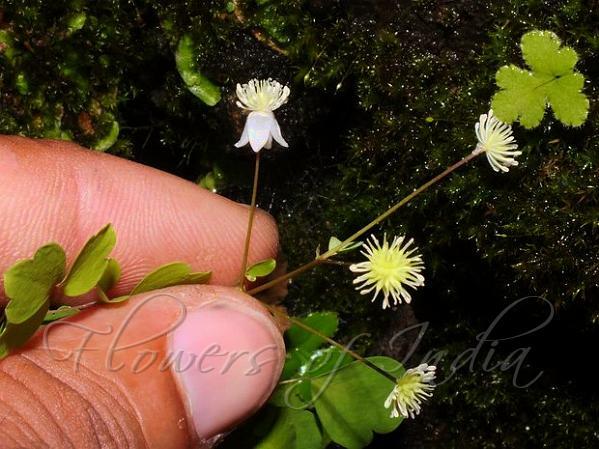 It has some similarity to the medicinal plant Sanicle, hence the name. Leaves are 1-3, mostly arising from root, long-stalked, 15-25 cm across; upper ones smaller, 3-4-ternate; stipules free; leaflets broadly ovate or obovate, rounded or subheart-shaped at base, bluntly or rounded toothed or lobed, about 2 cm across, hairless. Flowers are small, white, in panicles; flower-cluster-stalks as long as leaves, divaricately branched, few-flowered. Sepals are elliptic, about 5 x 2 mm, white. Filaments are thread-like; anthers pointed. Achenes are numerous, stalkless or very shortly stalked, arranged in heads, ellipsoid, about 2 mm long, 3-ribbed on each face; style as long as achenes, hooked at tip. 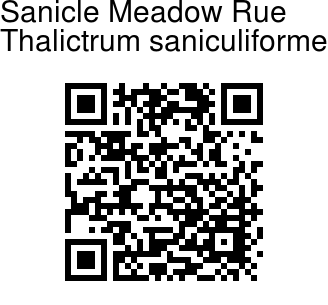 Sanicle Meadow Rue is found in temperate Himalayas, amidst mosses on tree trunks and rocks, also in Western Ghats of Peninsular India in Shola forests and adjacent grasslands, at altitudes of 1800-2500 m. Himachal Pradesh, Uttarakhand, Sikkim, Kamataka and Tamil Nadu. Flowering: July-September. Identification credit: Tariq Husain Photographed in Chakrata, Uttrakhand.